Been watching these as I really want decent wireless headset but never anything really decent under £100 or at least not what I've seen. Are these better than my Astro 50’s 1st gen? this is better deal then? £30 off your price im afraid op, they were £69.99 i believe from currys. These or the new cloud alphas? These were £69.99 on Currys last week. They are worth £70 or £100. 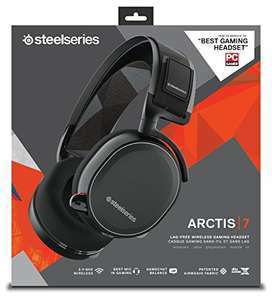 Unlike most gamer headphones these actually sound decent, they are the same drivers as in the Steelseries 800 and 840 which are also very good. im new to gaming headsets how does these compare to hyperx cloud 2 or hyperx revolver s? These were £69.99 on Currys last week. [Image] They are worth £70 or £100. U …These were £69.99 on Currys last week. [Image] They are worth £70 or £100. Unlike most gamer headphones these actually sound decent, they are the same drivers as in the Steelseries 800 and 840 which are also very good. Good price at £99 but yea they were 30 quid cheaper on black friday. I just missed out on them unfortunatly and was hoping a similar price might pop up in january sales. im new to gaming headsets how does these compare to hyperx cloud 2 or …im new to gaming headsets how does these compare to hyperx cloud 2 or hyperx revolver s?